There’s one problem with expecting all baby boomers to delay retirement beyond their 60s: it might not be fair. That’s because people with lower incomes and less education die younger than the well-to-do with more education. Think about what would happen if everyone retired at, say, 70. Those with less education and a lower socioeconomic status (SES) would enjoy fewer years in retirement than people with higher SES. 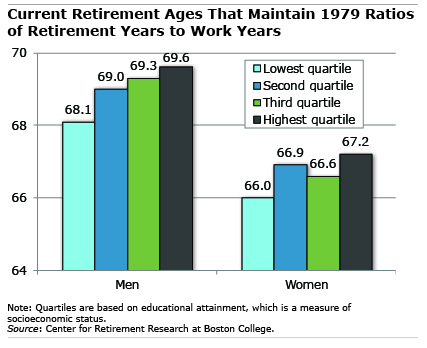 This gap in retirement duration has also widened in recent decades. That’s because the lowest SES group has seen much smaller improvements in their life expectancy, according to economists at the Center for Retirement Research, which supports this blog. Their study tracked adults surveyed by the U.S. Census Bureau over time and assigned each one to an SES group by sorting them into four education quartiles. Education levels correlate with income and are widely used to measure SES. The researchers, by using separate data that match the adults to their death certificates, found that while mortality improved for all SES groups, the gap between the top and bottom SES has increased over the past three decades. Converting mortality data into average life expectancies, they found that 65-year-old men in the highest SES back in 1979 lived nearly to age 79 – 1½ years longer than men in the lowest SES. But today, older men in the top SES are living to 85 – about 3½ years longer than the lowest SES group. It’s the time of year when we highlight blogs that attracted the most page views over the previous six months, according to Google analytics. Reverse mortgages, health insurance, marital histories, social networks, and even student debt – any or all of these can play a role in the financial security and well-being of America’s retirees. These are among the topics that will be explored during the 18th annual meeting of the Retirement Research Consortium, which features researchers from top universities around the country whose work is supported by the U.S. Social Security Administration. The meeting will be held on Thursday, Aug. 4, and Friday, Aug. 5 in Washington, DC. If having an adequate income in retirement won’t persuade you to delay that retirement date by a year or two, try this argument: you’ll live longer. A new study in the Journal of Epidemiology and Community Health found strong evidence that older workers who retire even one year later have lower mortality rates. This held true for both healthy and unhealthy people. The researchers at Oregon State and Colorado State used a survey of older workers to follow some 3,000 people who were employed in 1992 but had retired by 2010. Since health drives mortality and is a factor in deciding when to retire, they separated their research subjects into two groups – healthy and unhealthy – to see if they had different results. The healthy people were more likely to be physically active, non-smokers with a lower body mass index and fewer chronic medical conditions. Other research has shown that having meaningful work can also contribute to health at older ages. Over the period of the study, one in four unhealthy retirees died, compared with just about one in 10 healthy people. But the survival odds improved for people in both groups who retired after age 65, reducing the risk of healthy people dying by 11 percent and unhealthy people by 9 percent for each year of delay. Only about half of U.S. workers in their late 50s can be expected to remain employed at age 63, and less than a third make it past 65. 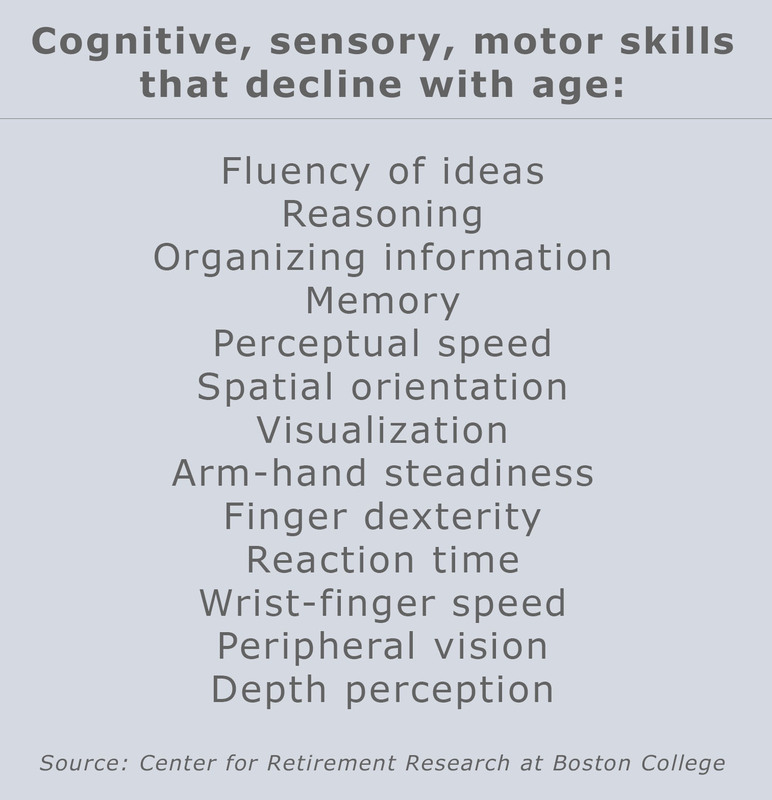 New research looks below the surface of these broad trends to reveal the role that the specific characteristics of individual occupations play in whether baby boomers can work longer. It’s very common for people unexpectedly hit with health problems or blue-collar workers facing up to their physical limitations to retire earlier. On the other hand, older people in some jobs have good odds of working longer. A new study by researchers from the University of Michigan and the Rand Corporation uncovered three characteristics that promote working longer that exist in a variety of jobs: low stress, stable job demands and duties, and the ability to transition to part-time work. The researchers used a survey of full-time workers over time, starting when they were 51 years old, to see when they retired. Their analysis then linked the workers to a separate database of job skills and characteristics to uncover specific jobs that led to earlier retirements (before age 63) or later retirements (after 65). It’s widely recognized that blue-collar workers retire relatively early, when their bodies start wearing out. But the assumption has been that people in less physically demanding white-collar jobs can carry on. However, that does not hold true for all white-collar occupations, according to a newly released study by the Center for Retirement Research, which supports this blog. This finding is especially relevant amid renewed discussions about again increasing the age when workers can claim their full Social Security benefits. This would effectively reduce everyone’s benefits by about 7 percent for each year the age is raised. Benefits are reduced either because individuals must wait longer to claim their full monthly benefit (which means receiving the benefit for a shorter period of time) or because they would receive a smaller monthly benefit if they don’t wait. The reduced monthly benefit would affect people who might be pushed into an earlier retirement due to age-related limitations on what they can do. Our personal biases can play havoc with how we handle our finances. The second bias is a failure to perceive the power of compounding investment returns and how this can build wealth over decades of saving. But the impact of these biases on how much people actually save wasn’t really understood – until now. A new study by a team of economists from Stanford University, the University of Minnesota, the London School of Economics, and Claremont Graduate University finds that people who are not blinded by these two biases in particular have saved significantly more for retirement, largely because they start putting money away earlier in life.